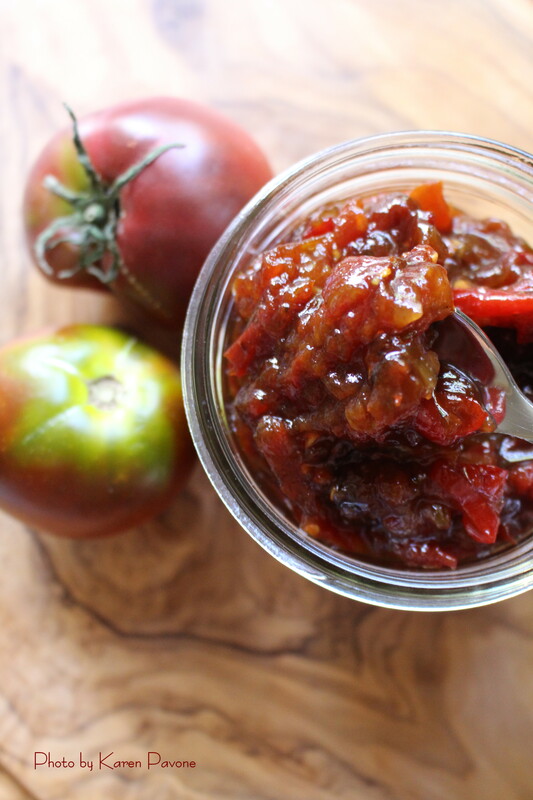 If necessity is the mother of invention, then Tomato-Bacon Jam is the answer to a bountiful late summer tomato harvest. Though I’m not a fan of adding bacon to cookies and ice cream, its smokey notes work beautifully in this rich, carmalized spread. Try slathering some on your next hamburger, adding it to your favorite grilled cheese sandwich, or spooning a generous dollop on scrambled eggs. The sweet and savory combination has a depth of flavor that will have your taste buds jumping for joy. One disclaimer: Once you’ve dipped into this flavorful condiment you’ll be tempted to eat the whole jar! This simple recipe is easily doubled to yield a larger batch. 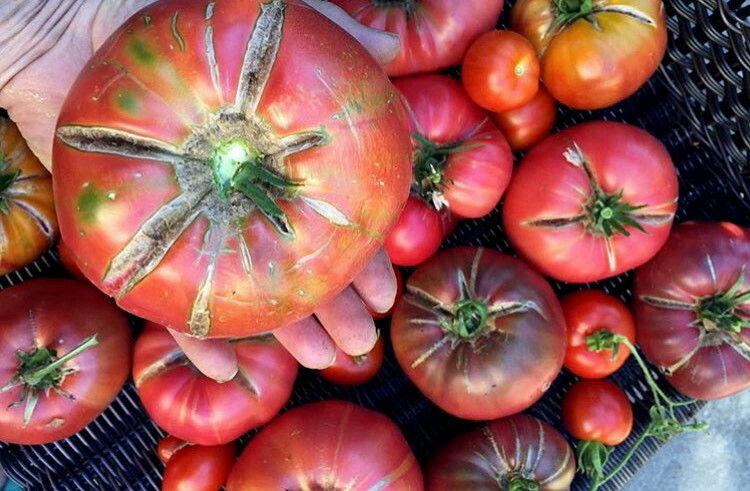 I’ve used both red and yellow heirlooms as well as cherry varieties with great success. I also prefer to leave the skin and seeds intact, which gives the finished jam a chunky, rustic texture. If you are vegan or vegetarian, don’t despair. You can substitute 1 1/2 teaspoons of smoked sea salt for the bacon which adds the desired flavor without using meat! (*NOTE: eliminate the regular sea salt if you do this). Smoked salts are available at specialty grocery stores like Whole Foods Market. 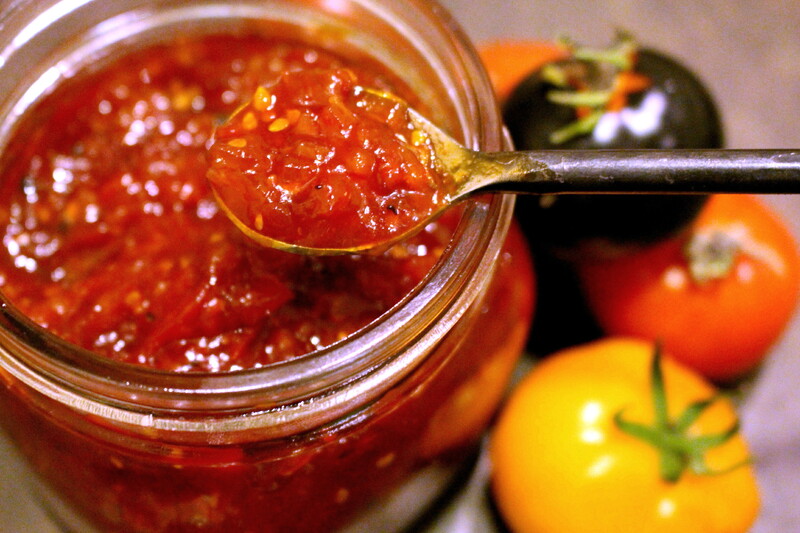 Which ever way you prefer to make it, be sure to cook up a batch of this jam. You’ll be glad you did! Cook the bacon in a large skillet over medium-high heat, turning occasionally, until evenly browned, about 10 minutes. Drain the bacon slices on paper towels. Crumble bacon when cool. Cool and spoon into a 1-pint glass jar with a lid; keeps refrigerated for 1 week or frozen for 2 months. If freezing, put spread into small jars and let jars thaw in refrigerator overnight before using. I am totally bookmarking this. I love bacon and tomatoes. This looks awesome! It sounds most delicious. I shall give it a go over the weekend! thanks for the recipe! Yes like a BLT but better! 🙂 Give it a try and let me know how you like it. Thanks for reading! Making this immediately, sounds too good to pass up! You’re going to love it! Please let me know how it turns out. Does that ever look delicious.I bet it is great over eggs. I like your hint for vegetarians. Sublime! Thanks for the recipe Karen.